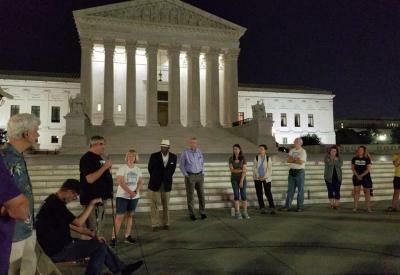 The annual Fast and Vigil, hosted by the Abolitionist Action Committee, takes place on the sidewalk outside the U.S. Supreme Court every summer from June 29th to July 2nd. The beginning and end dates of the four-day event mark two important Supreme Court decisions: June 29th is the anniversary of the 1972 Furman v. Georgia decision in which the Supreme Court declared the death penalty “arbitrary and capricious” and struck down all state statutes. July 2nd is the anniversary of the 1976 Gregg v. Georgia decision, which reaffirmed the death penalty, thus allowing executions to restart. Catholic Mobilizing Network has attended and cosponsored Starvin’ for Justice for the last 5+ years. This event is marked on every staff member’s calendar months in advance because of the inspirational people in attendance: longtime abolitionists who have been in the movement for decades, new activists with fresh faces and contagious energy, and “voices of experience” who share the pain the death penalty has caused them. Every evening is devoted to a speaking program where these “voices of experience”--death-row exonerees, family members of murder victims, and those with loved ones on death row--tell their personal stories and share why, despite their anger and grief, they still choose to oppose the death penalty. Heroes like SueZann Bosler, George White, and Dina Windle served as somber reminders that the death penalty only exacerbates and prolongs the pain of people who have undergone extreme harm. In addition to these “voices of experience,” leaders and organizers of national and local abolition efforts were invited to talk about the incredible work of their organizations. CMN’s new Executive Director, Krisanne Vaillancourt Murphy, and Emma Tacke, Associate Director of Community Engagement, had the chance to address the crowd to express gratitude for those on the ground working for justice and to share highlights of how CMN brings the Catholic voice and perspective to the abolition movement. The four night fast and vigil is as rejuvenating as it is exhausting. For Catholic Mobilizing Network, Starvin’ for Justice embodies why our work to transform the criminal justice system is so crucial. It is the stories of people whose lives have been radically derailed by great harm yet have committed themselves to speaking out against the most heinous practice of our country’s broken criminal justice system that fuels CMN’s work to end the death penalty. One day, there will be a new date this group of committed activists will gather on and it will be to celebrate a new Supreme Court decision: the nation-wide abolition of the death penalty. Until then, our work continues, and the fight for justice persists.